Are you a burger fan? I love burgers and to me, a burger is quite a satisfying meal. I've fallen so much in love with Bobby Flay's new book, Burgers, Fries & Shakes, that I'm going to be making a burger recipe each week from his book every Sunday for a new blog series, Bobby's Burger Bunday. Type of meat: Prepackaged or preformed patties tend to be inconsistent in freshness, texture, and flavor so grind your own or have a butcher grind it for you. Ground Chuck, preferably Certified Angus, is ideal because of its high fat content. 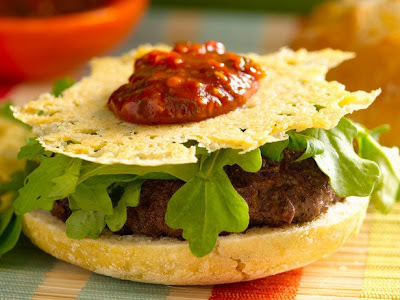 Look for 80/20 (80% lean, 20% fat) which will result in a flavorful and juicy burger. If you prefer turkey burgers, use ground turkey with a higher fat content too, such as 85/15 or 90/10. The turkey will be a combination of white breast meat and dark meat from the legs and thighs, resulting in more flavor and moisture. I season my burgers with kosher salt and freshly ground black pepper and that's it. Although I will occasionally crust the exterior of a burger with a spice rub, I never mix any spices, herbs, or condiments into the meat itself. Nor do I add ingredients such as onions or garlic or fillers such as eggs or breadcrumbs. My reasoning for this is pretty simple: do all of that and you'll have meatloaf. I do, however, make an exception to my rule when making fish burgers. On the whole, seafood contains very little fat... but this leanness does mean that fish burgers could use a boost in flavor and moisture. Additional ingredients also help to bind delicate fish into a burger that will hold its shape during cooking. 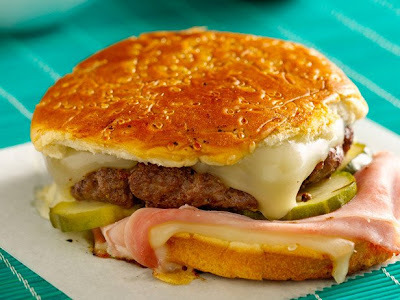 Forming your burgers: Try to mold the meat into uniform, fairly flat patties that are no more than 3/4 inch thick. Don't overwork, squeeze, or compress the meat as you shape them - they may end up dry and tough. If you're making seafood burgers, you'll want to chill the formed patties to help hold it's shape when it's cooked. Another key point is to make a depression in the center of the burger with your thumb. This prevents the center of the burger from "puffing up" while it cooks and ensures juicy, moist burgers. Don't press on them! When you press on the burgers as they cook, you end up squeezing out the flavorful juices and can lead to flare ups on the grill. So whatever you do, resist the urge to press! Cooking up burgers: You can grill the burgers outdoors with a gas or charcoal grill. If you are cooking indoors, you can use a cast iron skillet, grill pan or a griddle. Cast iron produces a great crust on the meat making it an ideal vessel to cook burgers in. You can also use a stainless-steel saute pan or skillet if you don't have cast iron. When it comes to seafood burgers, nonstick pans are the best choice. Because seafood burgers are pretty delicate and have a tendency to stick to other surfaces or fall apart, non stick pans make it much easier to keep the shape of these burgers. Turkey burgers and chicken burgers must be cooked completely through t prevent salmonella poisoning. But since the bacteria is killed at 165 degrees F, you can cook your burgers to medium-well doneness, which is an approximate internal temperature of 165 degrees F.
What about buns? Bobby prefers buns to be soft and slightly toasted so that it can mold itself around its contents. Artisnal breads have a tendency to be too hard and can break up the burger when you bite into it. If you're looking for a supermarket brand, Bobby recommends Pepperidge Farm sesame seeded hamburger buns - they are tender yet substantial with an appealing touch of sweetness. In addition to Bobby's burger recipes, I'll also share his recipes for burger accompaniments including French fries, potato chips and onion rings as well as condiments and seasonings. And what's a sweet ending to every burger meal? Milkshakes! While we're in the summer season, you'll be sure to find some of Bobby's delicious milkshake recipes in the Burger Bunday posts! I invite you to share your burger recipes too and I'd love to link your blog with each weekly Bobby's Burger Bunday post. Send me an email ([email protected]) with a link to your burger post so I can include it on Sundays! 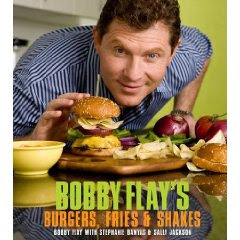 So please stay tuned on Sunday, June 14, 2009, when I kickoff Bobby's Burger Bunday with the first burger recipe from his book! Such a great idea! I love burgers and I love grilling all summer. :) I'm looking forward to seeing what recipes you choose. What fun! I have this book on my list to purchase! I'm looking forward to your updates. cool burger tips... now i'm wiser... Thanks Joelen! I can't wait for this series of recipes! Great idea! I'm a burger fanatic. I'll look forward to this every week.